The Ministry said that after monitoring waste pick up they found that in most cases, the bags containing recyclable materials were arriving and the Material Recovery Facility only half full. This change will decrease the cost of recycling significantly to less than half of its former cost, the Ministry said. 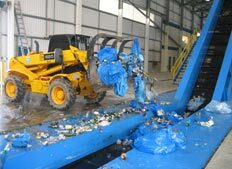 The Department of Waste management within the Ministry of Public Works has announced that, beginning August 1, 2012 residential TAG [tin, aluminum and glass] recycling pick up will change from weekly to fortnightly. The Waste Management Department carries out monitoring of waste pick up including recycling and has found that in most cases, the bags containing recyclable materials were arriving and the Material Recovery Facility only half full. In an effort to be more cost effective, residential recycling pick up will now take place every two weeks. This move will decrease the cost of recycling significantly to less than half of its former cost. The 2012 Garbage and Recycling Schedule can be found on pages 28-29 of the BTC phone book Blue Pages or on-line at http://www.wastemanagement.gov.bm. Tin and aluminum recyclables are shipped to the North American recyclables market where they are melted-down, turned back into new cans and can be back on supermarket shelves within 60 days of recycling. Glass is reused on-island in a host of construction projects and saves the expense of purchasing aggregate and fill-materials. In 2011 Bermuda shipped 134 20’ shipping container loads of various recycling commodities off-island to the US recyclables market. The Ministry thanks the public for their understanding as this new schedule is implemented.